Strength training, and bodybuilding or muscle building do not necessarily have the same goal. Strength training targets essentially the neuromuscular system, while muscle building (bodybuilding) aims to build larger muscles through modifying muscle cell physiology. Although larger muscle mass and overall physical size may provide some strength advantage, the enhancement of physiological systems is directed in somewhat different directions. Below, you will see how performance goals and appropriate training approaches apply to each outcome—muscle or strength. Muscle building targets hypertrophy of muscle tissue—the muscle gaining overall size. Some of the gain may be in an increase in fluids within the muscle cells (sarcoplasmic hypertrophy) rather than making more new muscle fiber. Strength training aims to increase the functional ability of muscles. It targets neuromuscular development in conjunction with the development of type 11a muscle fibers. In addition, strength training focuses on myofibrillar (muscle fiber threads), and muscle training on sarcoplasmic (cell cytoplasm) enhancement—which doesn't mean there is not crossover development with either training focus. Another example of such differences in human performance targets can be seen in training for speed or endurance. Speed training, sprinting, for example, emphasizes fast-twitch, type 2 muscle fibers that develop the energy systems to execute explosive power, whereas endurance training builds energy systems (mitochondria) that provide energy for the longer endurance events. You can train in a way that develops either of these energy systems even though each of us is more or less endowed with a predominance of fiber type. A balanced nutrition program that supports low body fat maintenance and sufficient protein to build muscle. Progressive overloading is necessary for maximal muscle fiber recruitment and size increases, which means that alterations in weight training program design for muscle hypertrophy will be most beneficial for maximizing muscle over time. For novice and intermediate individuals, it is recommended that moderate loading be used (70-85% of 1 RM) for 8-12 repetitions per set for one to three sets per exercise. For advanced training, it is recommended that a loading range of 70-100% of 1 RM be used for 1-12 repetitions per set for three to six sets per exercise in a periodized manner such that the majority of training is devoted to 6-12 RM and less training devoted to 1-6 RM loading." It is recommended that novice to intermediate individuals train with loads corresponding to 60-70% of 1 RM for 8-12 repetitions. Advanced individuals cycle training loads of 80-100% of 1 RM for 1-6 sets to maximize muscular strength. You can see that in these guidelines based on those established by the American College of Sports Medicine, that the training is similar for novice to intermediate, developing basic strength and muscle. 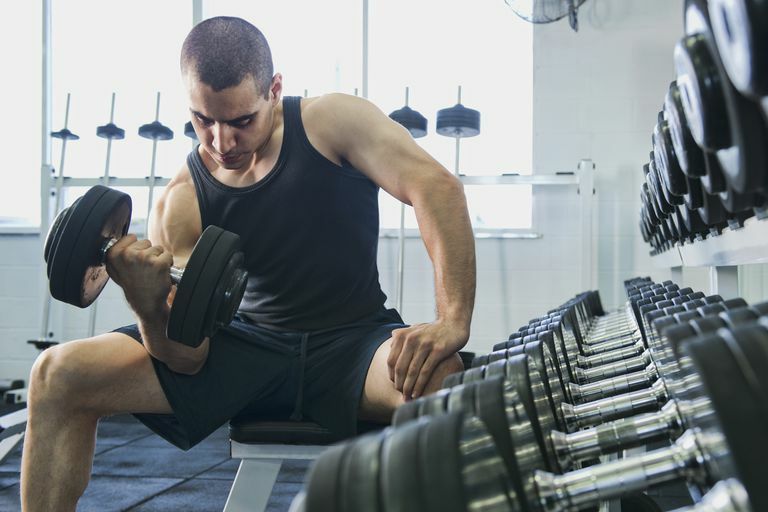 But advanced trainers tend to more repetitions and lower weights for bodybuilding, and higher weights and fewer repetitions for strength training. For most recreational athletes and fitness trainers, a suitable combination of strength and muscle training will be the most useful. However, should you need to specialize, it's worth knowing how to diverge in your workout protocols once you reach an intermediate weight training level of condition. Whether you train for strength or muscle, or a combination, you need to be committed to the appropriate exercises and program protocols to achieve success. Nicholas Rates, Brent Alvar, Tammy K. Evetoch Terry J. Housh, W. Ben Kibler, William J. Kraemer, N. Travis Triplett. Progression Models in Resistance Training for Healthy Adults. Medicine & Science in Sports & Exercise: March 2009, Volume 41, Issue 3, pp 687-708.